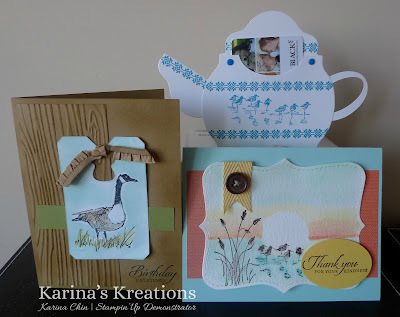 Karina's Kreations: Stampin'Up Wetlands Stamp Set of the Month! 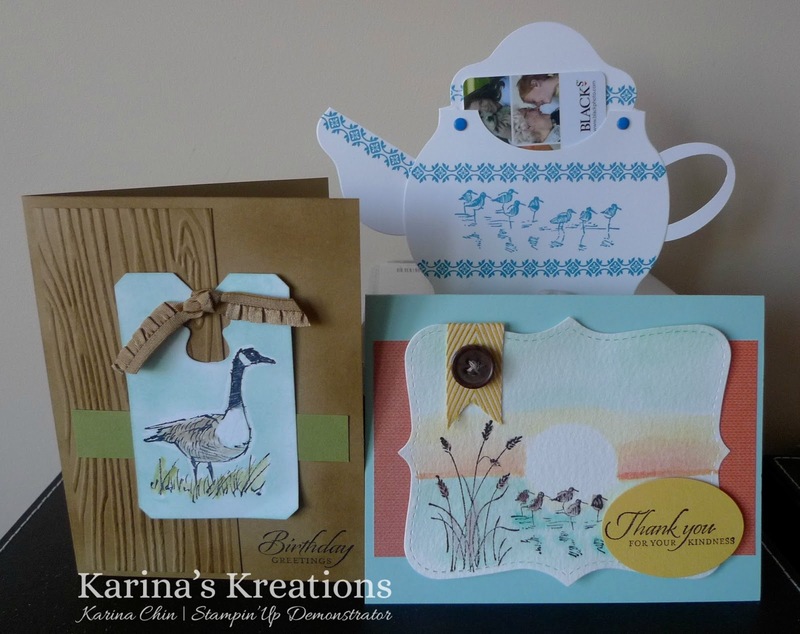 Stampin'Up Wetlands Stamp Set of the Month! Do you love stamping but can't make it to classes? Check out my Stamp Set of the Month Club! Every month you'll receive a stamp set valued at $21.95-24.95, three finished sample cards, supply lists and instructions to make more cards at home. You'll love having the finished sample in your hands and the instructions to make more!!! Some months will also include a video! The cost is $30.95 ( clear mount) or $35.95 (wood mount) and will be shipped to you by the 15th of the month. 1) Sign up for 8 months and get $35.00 in Free product one of the months plus a sign up bonus in the form of a stamp set or product valued at $24.95. Don't like the stamp set that month? No problem, substitute another set or product of the same value. 2) Sign up for 1 month and get the stamp set of the month series you want. Buy three months and get $5.00 off your 4th month! The stamp set of the month for August uses the Wetlands stamp set. It features watercoloring, a Crayon resist technique and a teapot gift card holder. Sign up by August 5th to get this set of cards! Email me at kchin2@telus.net!